The Ultra Vibe has been known as "the one to own". And now the Mojo Vibe picks up where the Ultra Vibe left off. At half the size (approx. 4 1/2" X 4") and weight of the original Ultra Vibe the Mojo Vibe will leave you with more real-estate on your pedalboard than any other true vibe effect available. The Mojo Vibe is not a bells and whistles type of effect. The features have been chosen from customer suggestions and usability from my own experience as a professional player for over 35 years. 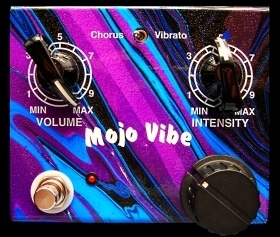 So if you want simply the best vintage Uni-Vibe sounding pedal available, then look no further than the Mojo Vibe. Features - 9 volt DC powered Now you can use those nice power supplies that are available or the optional wall wart. (see bottom of this page) That 9 volts DC is converted to 18 volts DC internally to retain headroom and ability to use the original bulb that is so very important in getting the right "throb" or "wobble" in the sweep. Internally switched FET buffer pre-amp - Switched with a miniature DIP switch, you can choose the warm vintage input configuration or a modern fet buffered input for a brighter sound. This differs in that most vibe makers switch a simple resistor in and out for the two different styles, but it still chokes off the response of your guitar. With the fet buffer this will not happen. The only time the buffer (when selected) is present is when the effect is engaged. Not to be confused with a buffered bypass. It is still true bypass. Speed Controller Input - Just about any passive type volume pedal or expression pedal will work with the Mojo Vibe. Of course some better than others, due to the value of the pot in the pedal. The ideal value would be a 100K reverse log taper. But I have found that many other values will work satisfactorily. To conserve space the Mojo Vibe uses a ¼" stereo tip, ring, sleeve switching jack for the controller input. You can use it as is with expression pedals where the cord is already connected to the pedal such as Roland, Boss and other keyboard expression pedals. To use a passive volume pedal you will need a special cord that consists of a ¼" stereo plug on one end and splits into two mono ¼" plugs. These are the same cables used in the channel inserts on mixing consoles and are readily available at most music stores. Chorus / Vibrato Switch - Ok, so it’s not really a chorus as we know them, but we’ll stay with the original terminology. This uses a short bat (so it’s hard to break off) miniature toggle switch to decide the output. Either the original "chorus" / Uni-Vibe sound or a wild vibrato can be chosen with this switch. Volume Control - Adjust the output to match the input level. Intensity Control - Adjust the depth or "intensity" of the effect, also effects the bias of the sweep to some degree. Speed Control - Adjusts the speed of the sweep. From a slow rolling phase to a bubbling, watery, pulsing throb. True Bypass - with LED that pulses in time with the speed setting. Aluminum Case - Chosen over steel for superior shielding properties and lighter weight.